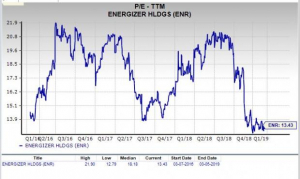 Energizer Holdings Inc. ENR reported fourth-quarter fiscal 2018 results, wherein both top and bottom lines came ahead of the Zacks Consensus Estimate. However, revenues tumbled year over year, which along with soft gross margin seem to have weighed on investors’ sentiments. 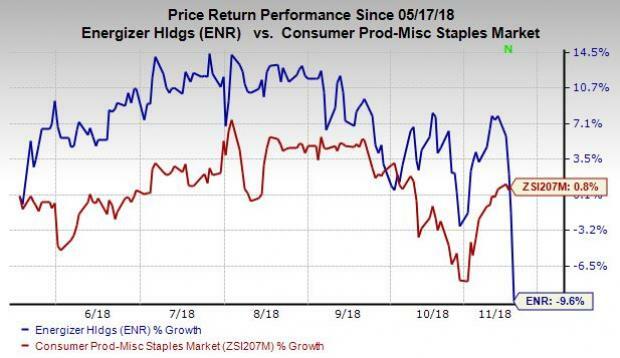 Evidently, shares of Energizer lost 8.1% yesterday, taking this Zacks Rank #4 (Sell) stock’s past six months performance to a decline of 9.6%, against the industry’s growth of 0.8%. Adjusted earnings per share (EPS) came in at 83 cents that beat the Zacks Consensus Estimate of 81 cents. Moreover, the figure surged 53.7% from the year-ago quarter driven by reduced promotional activity, SG&A costs and lower tax rate. Revenues of $457.2 million surpassed the consensus mark of $455.8 million but decreased 1.7% on a year-over-year basis. Notably, this is the fifth straight quarter of a revenue beat. The year-over-year revenue decline was a result of reduced hurricane activity and unfavorable currency impact of 1.2%. Organic sales slipped 0.6%, owing to unfavorable impact from Argentina operations and foreign currency headwinds, partly offset by gains from Nu Finish acquisition. Batteries revenues (89.2% of total revenues) dipped 0.4% year over year to $407.8 million, while revenues from Other segment (11.8%) fell 10.8% to $49.4 million. In Americas, the company recorded revenues of $297.1 million, down 0.8% from the year-ago quarter. Revenues from International were $160.1 million, down 3.3% from the year-ago quarter. Gross margin contracted 50 basis points (bps) to 45.5% due to unfavourable foreign currency translations. Selling, general and administrative expenses, excluding acquisition and integration costs, amounted to $88.1 million, reflecting a decrease of $10.6 million from the year-ago quarter. Energizer ended the quarter with cash and cash equivalents of $522.1 million, long-term debt of $976.1 million and shareholders' equity of $24.5 million. Year-to-date cash flow from operations were $228.7 million. Free cash flow amounted to $210.6 million and adjusted free cash flow was $237.8 million. Further, on a year-to-date basis, the company repurchased shares worth $20 million. Management continues to expect earnings per share in the band of $3.40-$3.50 for fiscal 2019. Net sales and Organic revenues are expected to rise low-single digits. Currency headwinds (excluding Argentina) are likely to hurt net sales by 1-1.5%. Nonetheless, net sales growth is expected to gain from Nu Finish’s acquisition to the tune of about 30-40 bps. However, gross margin excluding acquisition and integration costs is now expected to contract 30-70 bps, owing to unfavourable foreign currency translation. Capex is expected to be $30-$35 million. Adjusted free cash flow is anticipated to remain flat. The company has announced to acquire Spectrum Brands’ SPB auto care business in a deal worth $1.25 billion. The deal is anticipated to close by second-quarter fiscal 2019. The latter’s auto care brands include Armor All, STP and A/C Pro. 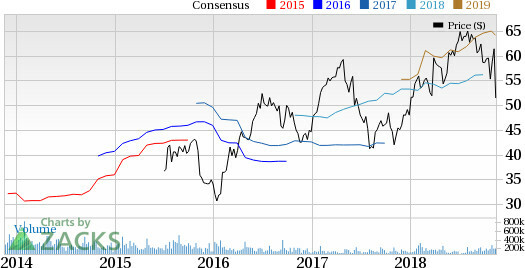 Lion Corp LIOPF has a long-term earnings growth rate of 10% and a Zacks Rank #2 (Buy). You can see the complete list of today’s Zacks #1 Rank (Strong Buy) stocks here. Ollie’s Bargain Outlet Holdings, Inc. OLLI has long-term earnings growth rate of 25% and a Zacks Rank #2.